Yesterday I brought you a Muslim drag queen, today I bring you Robbie Savage. With so much going on at the Edinburgh International Television Festival attending one event means you miss three or four others and all of equal billing. 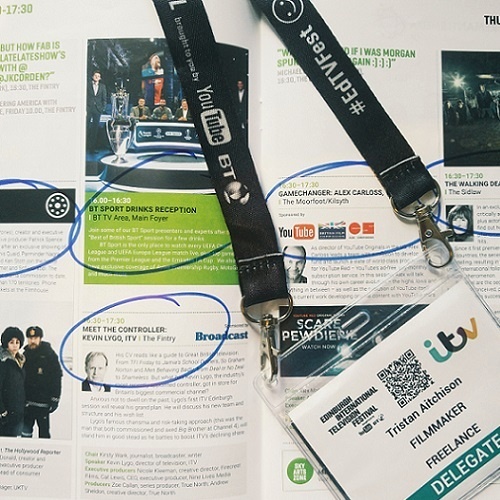 From a session with the creators of The Walking Dead to an exclusive screening of Sky Atlantic's worldwide hit Fortitude there are more things circled in my programme than my Radio Times at Christmas. Because I let The Guardian do the legwork on Shane Smith’s headline-making MacTaggart Lecture I was up early for a breakfast event hosted by Creative Skillset named You’re Hired! How New Apprentices Will Deliver New Industry Talent. As an emerging filmmaker myself, but more so as an educator of young people from the Highlands and Islands who want to become filmmakers, I have a passion for opportunity and opportunity for all. Working on the BFI Film Academy Highlands and Islands, a free to attend filmmaking course for 16 to 19 year olds in our region, wonderfully supported and showcased by XpoNorth, we are determined to create pathways for our young people who face all the barriers young people do plus the added challenge of being from a rural and isolated community. The next generation of creative talent from our area can now join the BFI Film Academy (applications open next week!) and they can go on to study Filmmaking at The University of the Highlands and Islands. These options did not exist three years ago. With schemes such at XpoNorth’s Hit the Ground Running, ScreenHI’s sponsorship of a place at EITF's The Network and indeed further down the line opportunities such as Creative Apprentices the way forward to a career in the film and telly world is now so much clearer for our young people. If you have the talent, determination and passion you can make it. Indeed Kenton Allen, CEO of Big Talk Productions, who was interviewed by young apprentices at the event said as much, adding more attributes such as an inquiring mind, good taste and ability to identify or tell a good story. What was very refreshing to hear from Mark Browning of the BBC was being from a different part of the country is good. All too often young creatives congregate in the same areas, Shoreditch for example, and it then becomes much more difficult to stand out. Our young people come from a place that is different and unmatched in beauty by any other part of the UK and they should embrace that and use it to their advantage in telling stories that are important to them. CEO of Creative Skillset Seetha Kumar reiterated this point by declaring the industry is in need of new voices, new experiences and new stories. It’s about time we had more television content from the Highlands and Islands and our young people are the ones to make that happen. 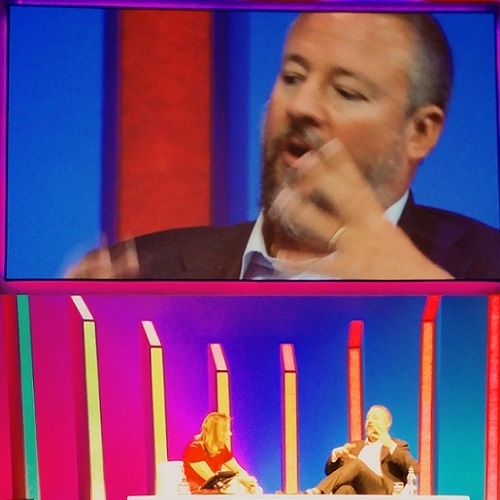 Image: The Shane Smith shakedown session with Jay Hunt of C4. The theme of young people in the industry continued into the Shane Smith shakedown session. 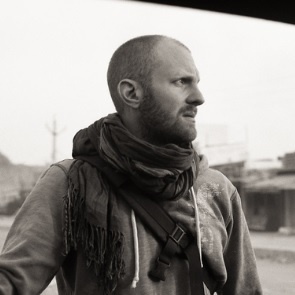 The CEO and founder of VICE was interviewed by Jay Hunt the Chief Creative Officer at Channel 4. Shane may be down with the kidz but judging by his hangover, after the opening night party at The Balmoral hosted by ITV, he no longer possesses the constitution of one. He should have followed my lead and snuck away in time to get home to watch the first episode of Bake Off. He again made the case that millennials are being short changed by the broadcast industry. They crave serious content and journalism and the industry has been very slow to catch up and perhaps can’t, given the average age at networks in the UK is in the 50s compared to 25 at VICE. Generation X making content and deciding what Generation Y wants to consume is never going to work. If there is an example of how hard work, drive, determination and passion can help a young person make it in the industry then Peter Rice is that example. Starting as a marketing intern at 20th Century Fox he is now CEO and Chairman of the Fox Networks Groups. The blockbuster Gamechangers session had Peter in conversation with filmmaker Bryan Singer. The director of X Men and The Usual Suspects and whose movies have grossed around 3 billion dollars worldwide met him after Peter had seen Bryan’s first ever film at a festival. In the days before social media, Peter had put a note in Bryan's designated pigeon hole at the festival. This was the only letter Bryan received from any network, distributor or agent. However it was an important communication as the filmmaker has gone on to become one of Hollywood’s most in demand directors and the pair are generally acknowledged to have rebirthed the comic book movie blockbuster with X Men. By now I hope you are wondering what Robbie Savage has got to do with Bryan Singer, except having the same number of bad haircuts as Singer’s had blockbusters, and the answer is nothing. However the entertaining football pundit was on a panel of sporting greats at BT Sport’s Best of British Sport event that included Irish rugby legend Brian O’Driscoll and double Olympic gold medallist Nicola Adams. The panel debated the greatest sporting achievement of the year before unanimously declaring Ross County’s Scottish League Cup victory the highlight of the decade. Oh I’ve just pinched myself. In a media marketplace where Gary Lineker is paid more to host Match of The Day than the BBC paid for the highlight rights to Scottish football there is more chance of Robbie Savage sporting a short back and sides than a Scottish sporting moment reaching the shortlist. Cynicism aside, Leicester City’s outstanding EPL win topped the audience vote. I began Day 2’s round up at the Edinburgh International Television Festival talking about opportunities and pathways to success for our young people. There must be no better role model for the younger generation than Olympic Champion boxer Nicola Adams. Being a black woman and LGBTI she has KO’ed barriers and floored ceilings to reach the top of her sport. From boxing rings to working on the box what is needed to succeed are the same things; talent, determination and passion. 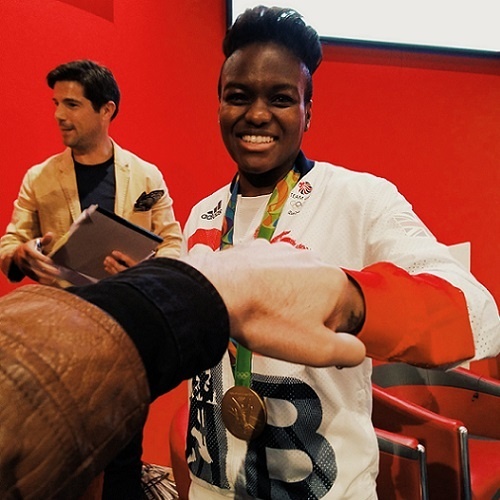 Image: Fist bump with double Olympic gold medallist Nicola Adams photobombed by the guy from the Everest double glazing adverts. Of course the EITF is not the only festival in town and The Fringe is in full swing. Ducking out of the Edinburgh TV Awards early ScreenHI hosted Highlands and Islands associates at a stand up comedy show with Glaswegian comic Gary Little. Infamous for being imprisoned for stealing 5000 books from his employer Harper Collins and flogging them on eBay. The comedian quipped you have more chance of meeting an Olympic gold medallist than a Platinum eBay Powerseller. Well thanks to ScreenHI and XpoNorth I met both in the same day.